Throwing a butterfly-themed party for a special little girl? Save some cash and download these free butterfly party printables to use as decorations! These cute butterfly birthday party prints include letters to form a “Happy Birthday” pennant banner, 2 inch cupcake toppers, welcome signs, butterfly party favor tags, straw flags, tented cards, and more. The theme is an adorable pink and purple so this party kit is perfect for a young child. 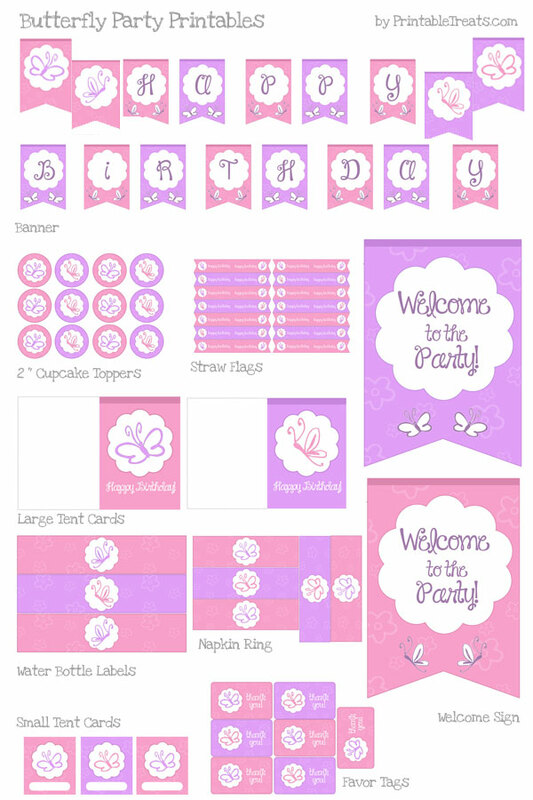 The butterfly party printables feature flowery background and a butterfly showing two full wings or a sideways butterfly. Both are very cute! If you would like to share the butterfly printables with a friend, please send them directly to this page (Do not link directly to the download file.) so that they can download a copy for themselves. It would be best to print these party printables on A4 size paper. They were designed to be printed on paper that is longer than the regular 8.5″ x 11″ computer paper.